In Part I a wave packet model is used to show that a time-developing mixing layer produces a Mach wave pattern similar to the one produced by a spatial-developing mixing layer. However, this kind of similarity does not exist for the sound emitted by subsonic sound sources. 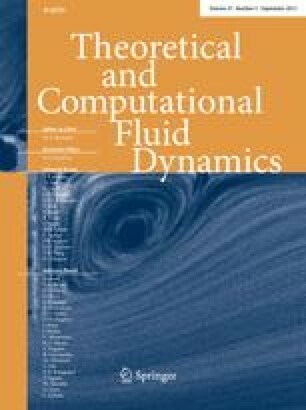 A method to analyse temporal direct numerical simulation (DNS) results for the Mach wave pattern is then developed and demonstrated using numerical results of the wave-packet model. The method is applied to the temporal DNS results of a supersonic mixing layer undergoing transition to turbulence. Two dominant Mach waves are revealed. The first wave originates from about the time of the Λ-vortex structure dominance in the layer. The second wave appears just prior to the final breakdown of the layer to a fine-scale turbulence structure. The second wave shows a higher level of a finite-amplitude wave behaviour and a smaller-scale source structure than the first wave. Directivity plots and frequency spectra are provided and discussed.